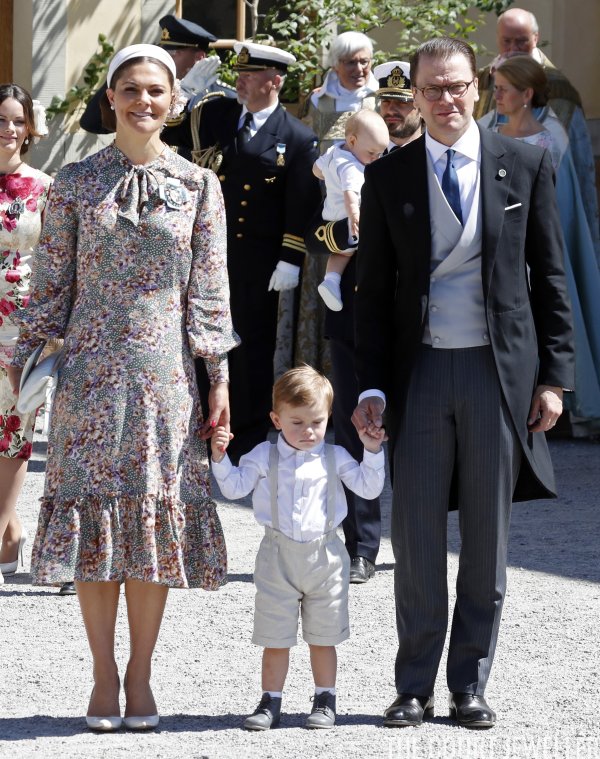 The newest member of the Swedish royal family, Princess Adrienne, was christened in the chapel at Drottningholm Palace this morning, and her family wore lots of jewels to celebrate. Baby Adrienne is the third child and second daughter of Princess Madeleine of Sweden and Chris O'Neill. 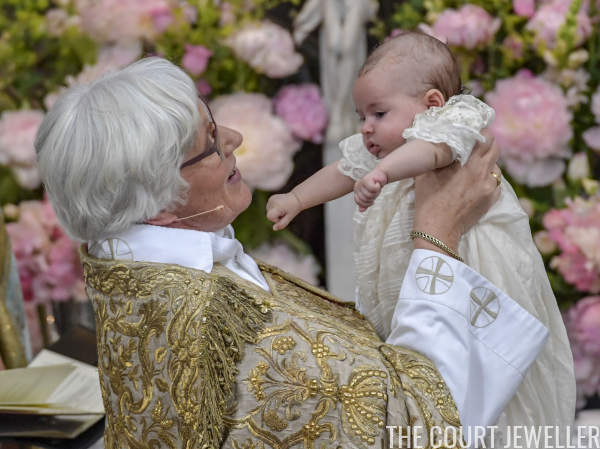 She was christened by Archbishop Antje Jackelen. Adrienne got a little accessory of her own during the christening. 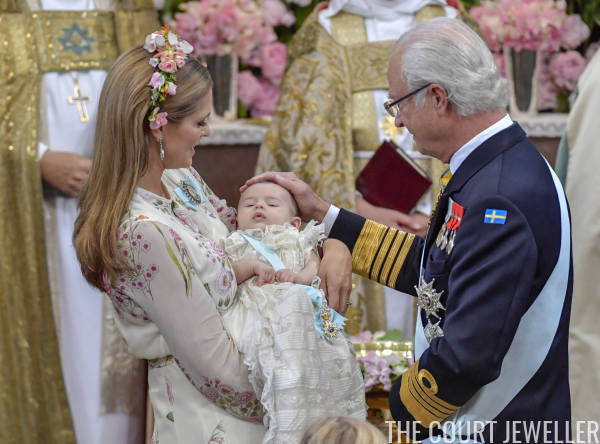 Her grandfather, King Carl XVI Gustaf, presented her with baby-sized insignia from Sweden's highest chivalric order, the Order of the Seraphim. 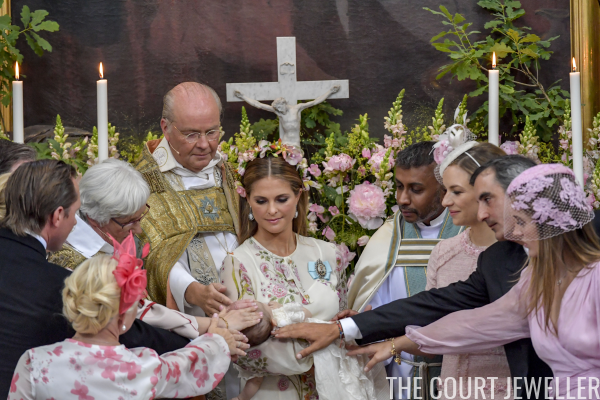 For her daughter's christening, Princess Madeleine borrowed some major heirloom jewels from the family vaults. Her drop earrings are the diamond and cameo earrings from the family's Cameo Parure. 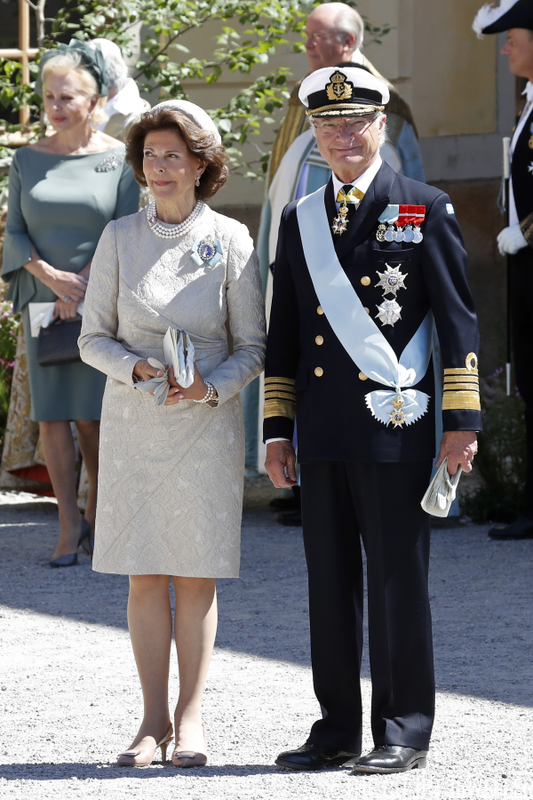 The suite, which (like the Bernadottes themselves) has roots in Napoleon's imperial court, was an especially appropriate choice for the christening of a Swedish princess with a French name. Madeleine also wore the pearl, diamond, and cameo bracelet from the parure on her right wrist. She also chose to forego a traditional hat, wearing a headband festooned with silk flowers instead. 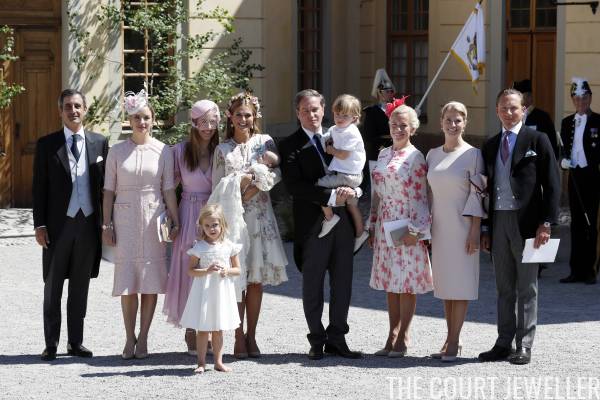 Here's a look at the entire O'Neill family: Chris, Princess Madeleine, little Princess Adrienne, Princess Leonore (who lost her shoes somewhere! ), and Prince Nicolas. June 8th is a particular significant day for this family: Adrienne was christened on the fifth anniversary of her parents' wedding, and exactly four years after the christening of her big sister, Leonore. 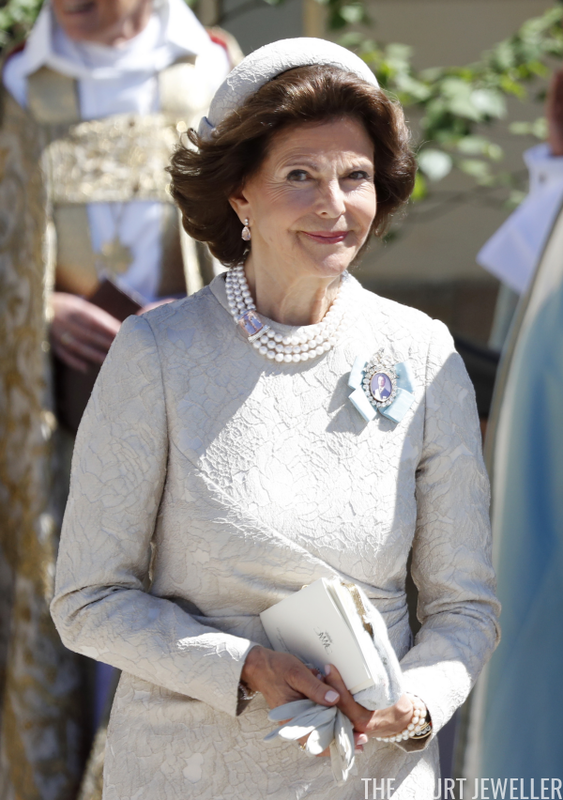 Adrienne's maternal grandmother, Queen Silvia of Sweden, wore beautiful pieces from her pearl collection for the christening. Her three-stranded pearl necklace has a topaz clasp, which coordinates with her drop earrings. You'll also spot pearl bracelets on both of her wrists. Here's a look at Silvia's entire ensemble for the occasion. Adrienne's paternal grandmother, Eva O'Neill, chose diamonds for the event. Her intricate diamond fan brooch looks like it might coordinate with the diamond bracelet on her left wrist. 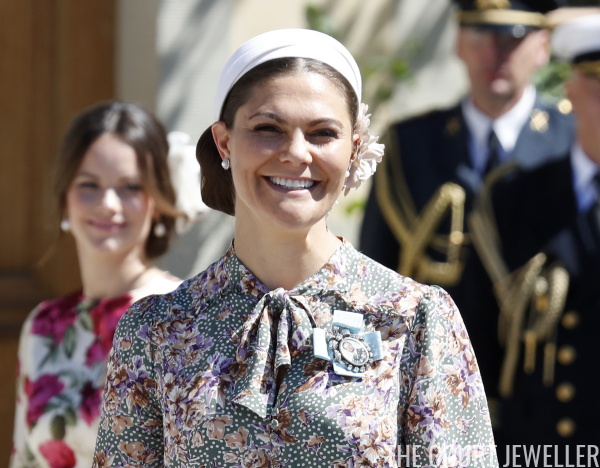 The baby princess's aunt, Crown Princess Victoria of Sweden, chose understated pearl and diamond cluster stud earrings for Adrienne's christening. 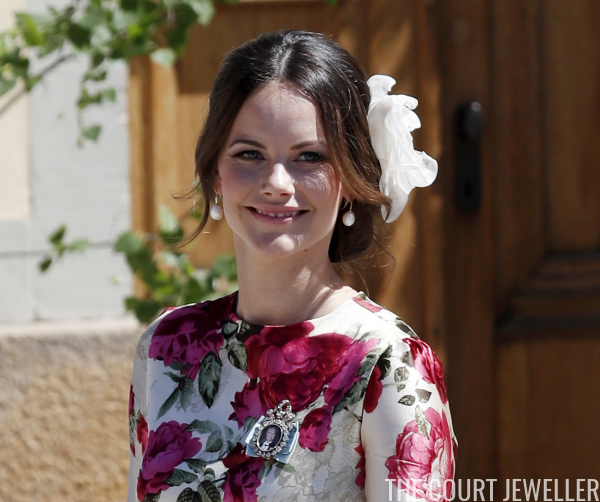 Adrienne also has one other royal aunt: Princess Sofia, the wife of her uncle, Prince Carl Philip of Sweden. Sofia chose earrings with large pearl drop pendants for the christening. 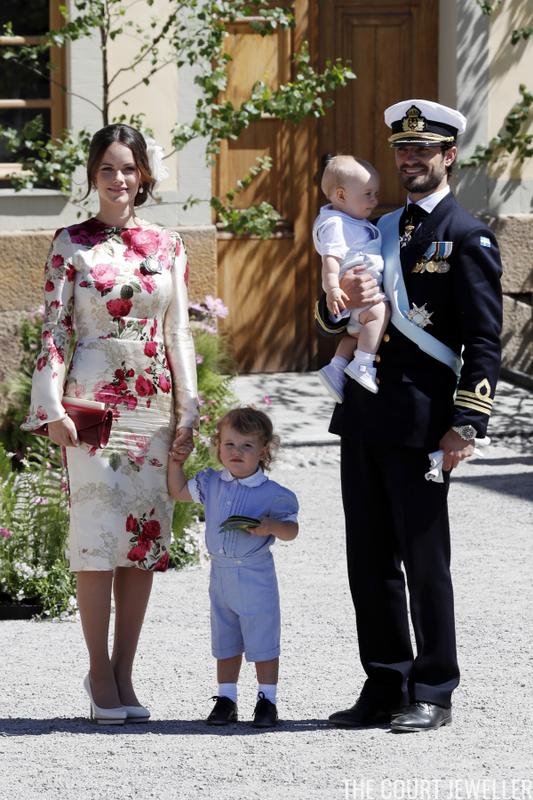 Sofia was accompanied by Carl Philip and their two sons, Prince Alexander and Prince Gabriel. Unlike her royal cousins, Princess Adrienne did not have any royal godparents. Anouska d’Abo (Chris's niece), Charlotte Kreuger Cederlund, Coralie Charriol Paul, Nader Panahpour, Baron Gustav Thott (who recently married Madeleine's close friend Louise Gottlieb, one of Princess Leonore's godparents), and Natalie Werner served as Adrienne's godparents.